In its almost century-and-one-half existence, the chapel interior has undergone numerous renovations, absorbed various additions and decorations, and moved from gas light to electric lighting. All the while, it retained a rather antique ambient, in spite of the fact that, before the restoration, the interior had contained almost nothing of the original decoration other than the wood of the ceiling, the wainscoting, and the plaster of the walls. We have no record of J. R. Lamb's original color scheme or decoration. 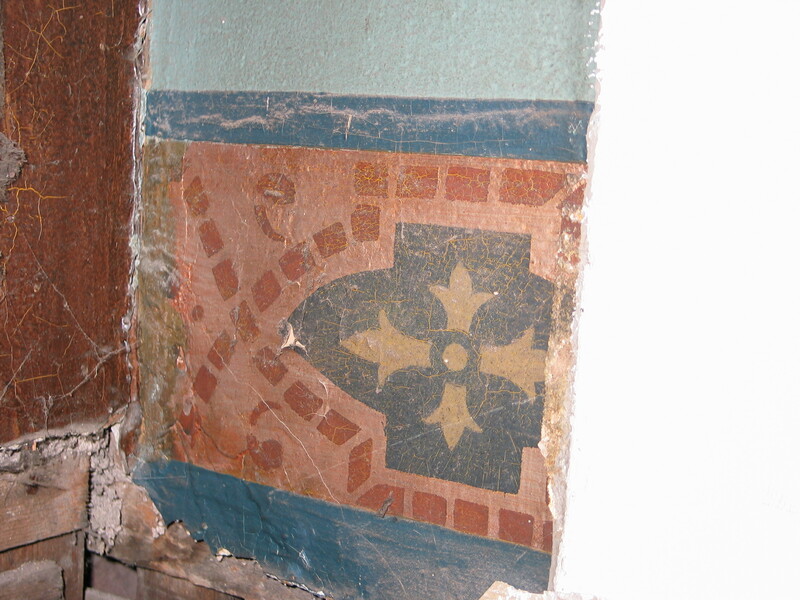 However, we have uncovered some of the wall decoration from the early days of the chapel. As the work of restoration progressed, remnants of earlier, long covered chapel decoration emerged. They are once again covered. Ceiling decoration uncovered behind the organ case that was removed during the renovation. It probably dates to the 1906 renovation. 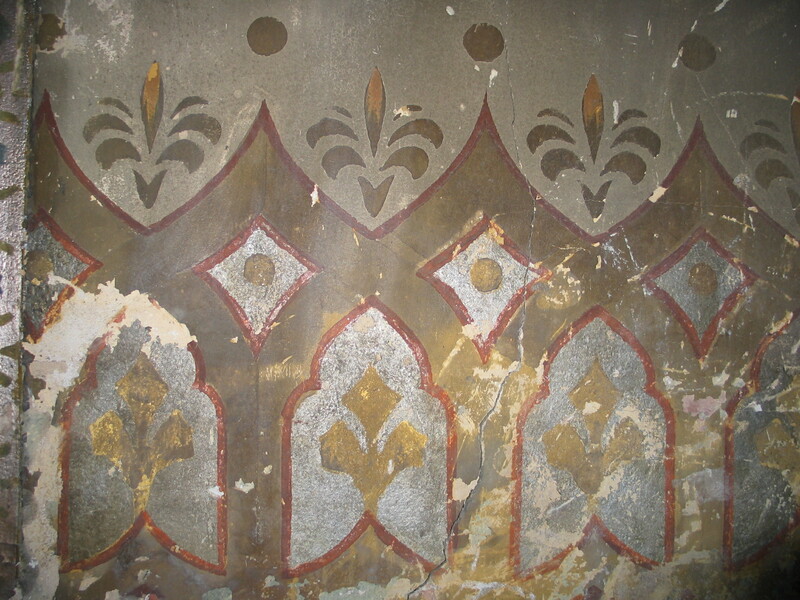 Decoration on the nave wall that may be part of the original decoration of the chapel. A remnant of wall decoration found in the confessional area. One of the earliest additions in the chapel is the memorial to the college registrar and four students who died during the 1860s. It is on the right side of the chapel as you enter. 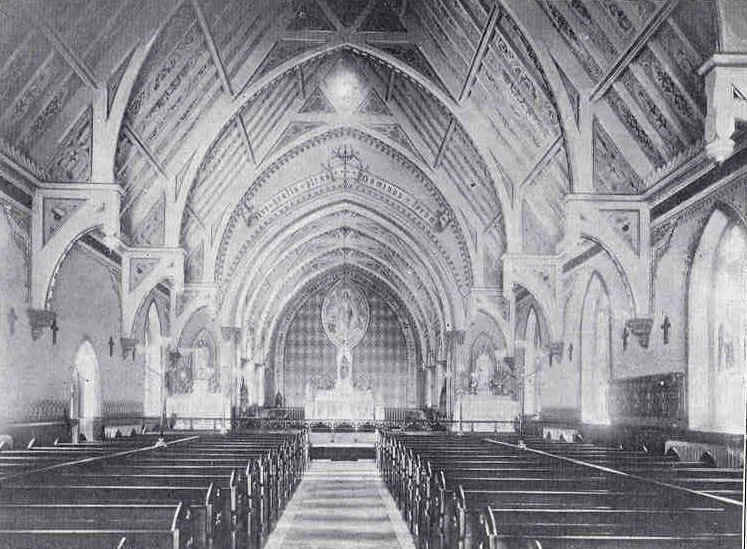 The earliest photograph of the interior of the chapel dates from 1895. As you can see, it is quite different. The altars are wood and there is no mural on the sanctuary wall. 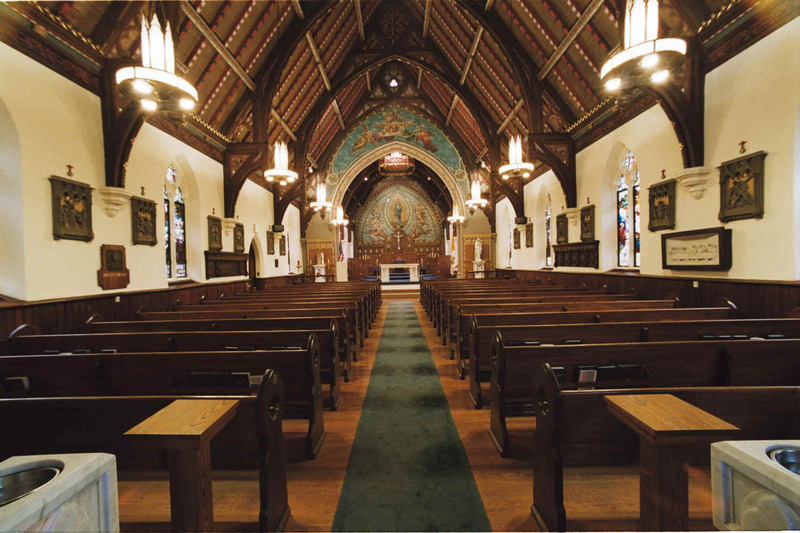 Like the exterior, the interior of the chapel was extensively renovated as part Seton Hall's 1906 golden jubilee. A new color and decorative scheme, including a portrait of the Immaculate Conception in the center of the sanctuary wall, was introduced under the direction of Professor Ferdinand Baraldi. The former entrance was transformed into a chapel dedicated to the Sacred Heart. In 1915, a marble altar replaced the main altar and the side altars were painted white. In 1928, marble holy water fonts, donated by the class of 1927, were placed at the entry. The diamond jubilee of the college in 1931 occasioned further changes. New marble side altars and marble statues of the Blessed Virgin and St. Joseph were installed and the ceiling beams were painted in faux wood. A terrazzo floor was installed in the sanctuary. New Stations of the Cross were installed. The most dramatic part of the 1931 renovation was the installation of murals on the sanctuary wall and over the sanctuary arch. Gonippo Raggi surrounded Baraldi's Madonna with multicolored angels on a midnight blue background accented with glittering golden stars. Above the sanctuary arch he depicted the Holy Trinity against a background of a multi-hued sky. Not long after, a memorial to Benjamin Savage, the college handyman who left his savings to Seton Hall, was placed opposite the older memorial. Savage's memorial was designed in an appropriately similar style. In 1947, the Nolan family supported further renovations. The main altar was redesigned, a large marble crucifix was installed, and a baldachin placed above the altar. 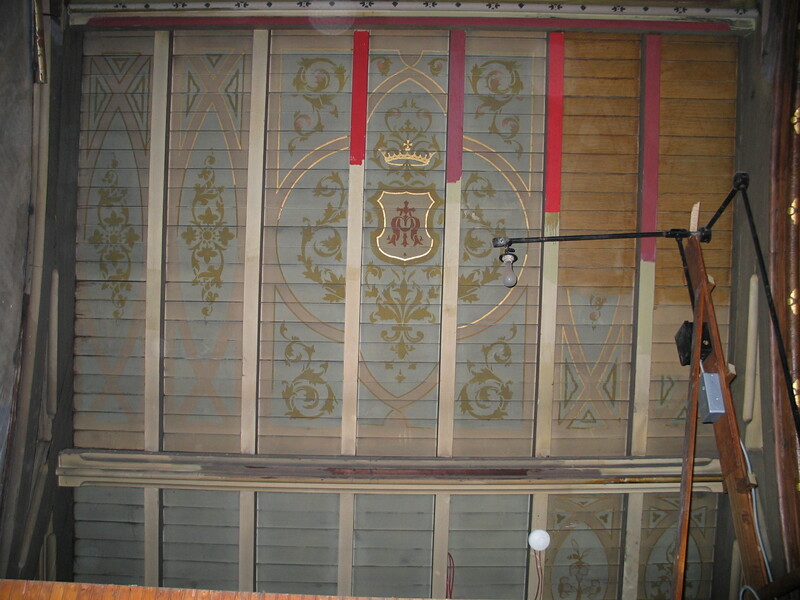 The lower portion of the rear wall of the sanctuary was enhanced with wood paneling decorated with the symbols of the Twelve Apostles. The chapel was painted in varying shades of blue. The 1960s saw further changes thanks to a gift from the Henderson family. Under the direction of Rambusch and Sons, the Sacred Heart chapel was transformed into a Gothic shrine dedicated to Mother Elizabeth Ann Seton. The ceiling above the nave and sanctuary was painted, the beams decorated in a chevron motif. The murals were "touched up" in a most unfortunate manner, a light blue covering Raggi's midnight blue and obscuring much of the detail. In the aftermath of the Second Vatican Council, a portable altar was introduced into the sanctuary, a harbinger of a more extensive renovation just a few years later. In 1972, the marble altars were removed and a new altar constructed from portions of the 1915 main altar. The walls and portions of the arch mural were painted over in gray. The Stations of the Cross were painted gray as well. A platform was created for the celebrant where the former main altar had stood. The tabernacle was moved to the place formerly held by the altar of the Blessed Virgin. The statue of the Blessed Virgin was placed on a platform where the altar of St. Joseph once stood. Most of the altar rail was removed, a short portion remaining attached to the walls. Over the years, in addition to major renovations, a variety of memorial plaques were added to the chapel. The result was the chapel with which the Seton Hall community has been familiar for more than three decades. But it is not the original chapel, it is not the chapel of 1906, it is not the chapel of 1931, it is not the chapel of 1947. Nor is it the chapel of the 1960s and 1970s. In a way, it is all of the above and none of the above. The chapel before the 2006-2008 renovations.